This elegant white flower bouquet is a classic way to show someone you care with a beautiful gift of freshly cut flowers. The colors and beauty of this centerpiece will add serenity to your home. 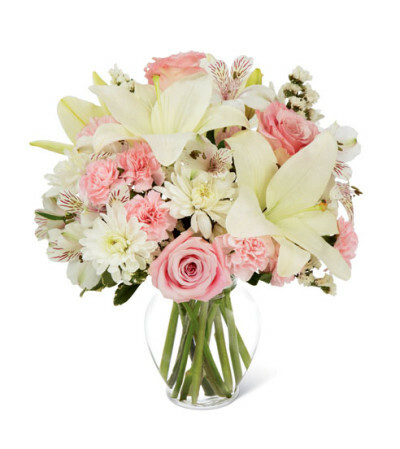 Hand-delivered from a local florist this arrangement features light-pink rose, chrysanthemum, statice, Peruvian and Asiatic lily blooms. 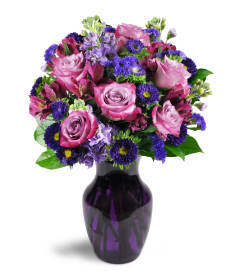 The display features pops of color with whisper soft pink carnation blossoms and rosey stems. 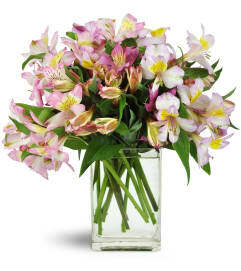 Have beautiful florals delivered for a friend, mom, or other loved ones to show them you care.